The SONICAVE is a mixed media installation placed in the old cave dome using its special acoustic, light, historical and symbolic aspects. Basicaly it is the interactive multichannel sound and light system placed in the cave bringing unexpected situation for the cave vistiors. 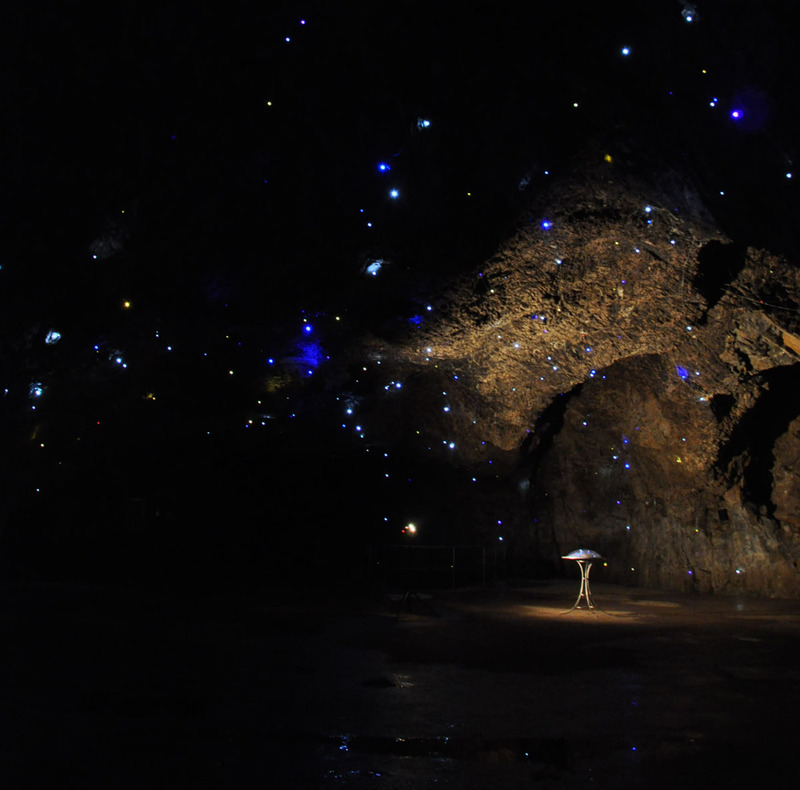 The installation is a permanent part of a every tourists tour inside the cave Vypustek in the Moravian Karst area. I understand the whole work as a big experimental electronic sound-light instrument that uses the cave space and acoustics as the unique resonant body. In this work I continue in my „abstract“ sound research where I practically explore the relation betwen sound and its actual environment The very big effort was given to discovering the ways of creating spatial “sonolights” or let say “lumisounds” as the compositional spatial units. I understand the composition here synestheticaly. I have connected the sound actions with the lights and synced together in the beginning – in the compositional procces. The all 508 LED lights in the cave dome can be composed directly in MIDI composition just together with the music composition. The regular realisation of this concept in real life was possible just because of quite long and intensive technology research and development. Sonicave is an art intervention into a public place normally not percepted as an art gallery. The „holiday tourists“ are here confronted with this piece which existence they usually dont expect. Sonicave searchs alternative possibilities of presentation of electronic art work in non-standart situation (compared to specialized place of the galleries).